trustee member of NYU School of Law. 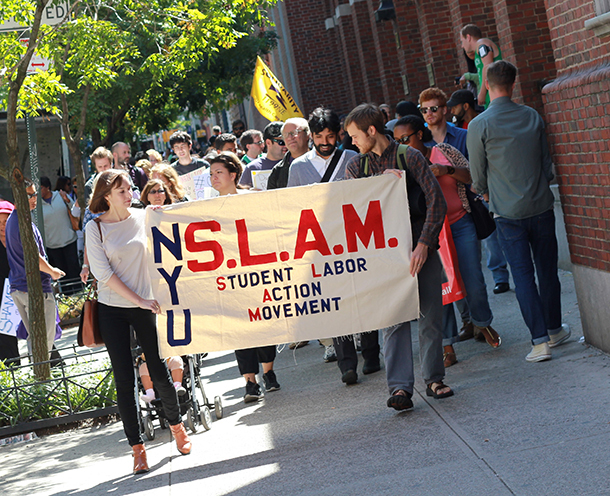 The protest was led by the NYU Student Labor Action Movement, and the shirts alluded to the dirty money NYU is receiving from Straus, who is currently in a contract battle with workers in his HealthBridge Management corporation. According to the Service Employees International Union, the Straus Institute for the Advanced Study of Law and Justice receives an annual endowment of $1.25 million from Straus. The SEIU first instigated the strike at Strauss’ HealthBridge in Connecticut and Care One in New Jersey. Gallatin junior Caitlin MacLaren was one of the main organizers of the NYU protest with Student Labor Action Movement. She hopes the demonstration will have an impact on Strauss’ alleged behavior. “[We hope that] Daniel Straus will clean up his act, start respecting workers and that his company will treat their workers fairly,” MacLaren said. However, Joseph Weiler, director of the Straus Institute and longtime colleague of Straus, defended the trustee. However, protest organizer MacLaren felt that Straus’ generosity did not excuse the way he allegedly treated his workers. “Daniel Straus is trying to use the name of NYU to appear to be a philanthropist, and we really don’t think he should be hiding behind the name of our university while at the same time breaking the law and treating workers unjustly,” she said. United New York, a group that advocates unemployed workers, rallied with NYU protesters and members of SEIU. Another group, hailing from Washington D.C., United Students Against Sweatshops, also joined the gathering. Straus is also the principal and CEO of several companies that invest in and operate health care service businesses. In response to the protest, he said the attack on NYU was unfair since the issues stem from a business dispute in Connecticut. He added that the SEIU is trying to distract from other controversies in Connecticut. “The SEIU has chosen to target my connection with NYU as part of its ongoing campaign of misinformation and ruthless tactics revolving around a business dispute in Connecticut,” Straus said. While caregivers were concerned about the lack of unions, Dolores Casey and Eileen Underwood, nurses who were replaced by cheaper workers, were frustrated with contract disputes. The protesters also drew a sizeable opposition yesterday. The counter-protesters stood on the street side, while the protesters stood on the same side of the park. The counter-protesters held signs as well, many of which read: “SLAM don’t speak for us” and “Stop SEIU lies.” They declined to comment. NYU police and the NYPD were present outside the Straus Institute and tried to keep protesters out of the street.